On: Press and hold the button for about 3 seconds to turn the NUU Riptide on. You will hear a two-tone (low-high) sound, indicating that the speaker is on. Off: Press and hold the button for about 3 seconds to turn the NUU Riptide off. You will hear a two-tone (high-low) sound, indicating that the speaker has been turned off. Auto-off: After 30 minutes of inactivity, the NUU Riptide will shut off automatically. To turn the NUU Riptide on again, Press and hold the button for about 3 seconds. The NUU Riptide will not automatically shut off if you are playing audio through Bluetooth, or 3.5mm connection. NOTE: The Bluetooth Status LED will light when the NUU Riptide is on, and go dark when it is off. The Bluetooth Status Light is a small LED located below the on/off button that illuminates to indicate the current status of the NUU Riptide’s Bluetooth connection. Flashing Slowly and Intermittently: The NUU Riptide is on and is not in pairing mode. This is also the indicator for “auto-reconnect”, where the NUU Riptide attempts to connect with the last paired Bluetooth device immediately after it is powered on. NUU Riptide will automatically enter pairing mode when it cannot find a previously paired Bluetooth device. Flashing Quickly and Steadily: Pairing mode. Solidly Lit: Paired and connected. Switch on the NUU Riptide. The Bluetooth Status Light will flash slowly. The NUU Riptide will attempt to re-connect with the previously paired device when it is powered on. If it cannot find the paired device, it will enter pairing mode automatically. You will hear a double-beep (low-low) when this happens. If the NUU Riptide did not automatically enter pairing mode,press and hold the Action Button for about 3 seconds. You will hear a double-beep (low-low) and the Bluetooth Status Light will flash quickly. The NUU Riptide is now in pairing mode. Enable Bluetooth on your phone or other device. * Then select “NUU Riptide” from the list of discoverable devices. If prompted for a PIN code, enter “0000” (4 zeros). It will take between 10 and 15 seconds for the NUU Riptide to pair with your device. When pairing is successful, you will hear a high tone and the Bluetooth Status Light will remain steadily lit. *Procedures for activating Bluetooth will vary across devices. Consult the documentation that came with your device for further information. The Action button doubles as a “Play/Pause” button. While music is playing, press and release the Action Button to pause the music. Press and release the button again to resume playback. Make Call: To make a call, make sure your NUU Riptide must be connected to your phone via Bluetooth. Dial as usual and speak towards the built-in microphone located under the power button. NOTE: The built-in microphone only works when your phone is connected via Bluetooth. Answer Call: To answer an incoming call, press and release the Action button. Incoming and outgoing calls are given priority over Bluetooth audio playback. If a call comes in while you are streaming Bluetooth audio, the track will pause and the NUU Riptide will play the ringtone. It will resume once the call has ended. Reject Call: To reject an incoming call, press and hold the Action Button for one (1) second. You will hear a two-tone sound and the call will go to voicemail. NOTE: If you hold the action button too long the NUU Riptide will enter pairing mode. End Call: To end a call, press and release the action button. Transfer From Speakerphone to Phone: During a phone call, press and hold the Action button for 1-2 seconds to switch between using the NUU Riptide and your phone to talk. You will hear a ‘beep’ indicating that the call has been transferred to your phone or the NUU Riptide. Press or hold the volume keys to adjust the volume. The NUU Riptide will beep with each change in volume. When you reach maximum volume, you will hear a high-pitched beep. When you reach minimum volume, you will hear a low-pitched beep. Volume may only be adjusted on the NUU Riptide while it is connected to a Bluetooth device. When the NUU Riptide is connected via the AUX-IN, the volume is set to maximum and must be controlled on your phone/device. NOTE: Music playback volume and speakerphone volume are adjusted separately, and may only be adjusted while the NUU Riptide is connected to a Bluetooth device. An occasional flashing red light indicates that the battery is low and should be recharged soon. When charging, this light is green until the NUU Riptide is fully charged. For best results, ensure the NUU Riptide is fully charged before use. Connect the supplied Micro-USB cable into the charging port, and plug USB side into your computer or USB AC adapter (adapter not included). The green charging indicator will remain illuminated while the unit is charging. The indicator will automatically switch off when the unit is fully charged. Allow approximately 2.5 hours for the battery to fully charge. The NUU Riptide may be used while it is charging. NOTE: Your computer’s USB port may not supply enough power to charge and play at the same time. 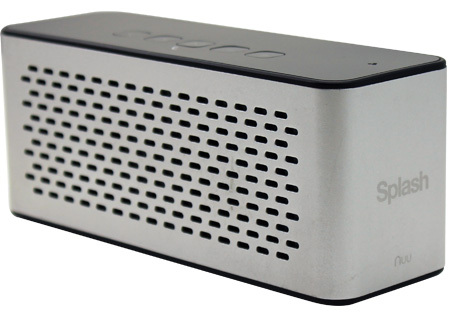 The NUU Riptide can be used as a USB speaker when connected to your computer’s USB port. Once connected you may control volume with either the NUU Riptide’s buttons or your computer’s volume controls. 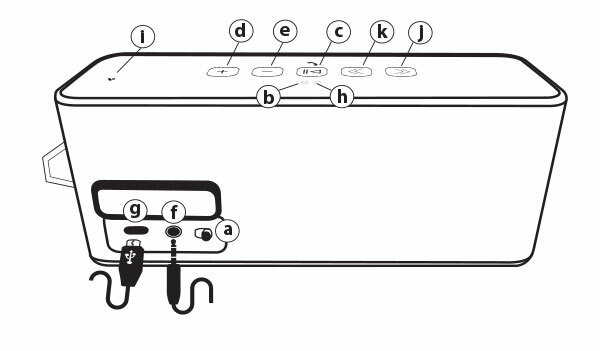 If the NUU Riptide does not automatically connect, you may have to manually select NUU Riptide as your output device. Consult your computer’s documentation to learn how to do so. 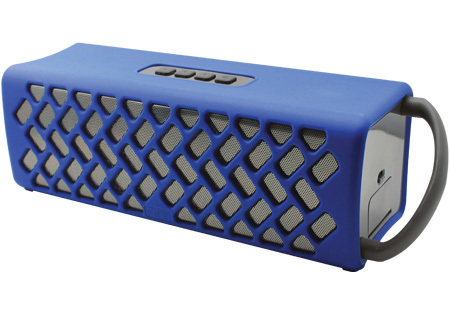 Ensure the NUU Riptide is fully charged before using as a USB speaker. Your computer’s USB port may not be able to supply enough power to charge and play music at the same time. Bluetooth required. Simply plug one end of the cable into the AUX-IN port of the NUU Riptide and the other end into the 3.5mm headphone jack of your phone/device. Like any phone/device headphone jack, the AUX-OUT of the NUU Riptide can be used as a music source that you can connect to another NUU Riptide’s AUX-IN to double the sound output power. NOTE: Audio content via 3.5mm stereo input will override audio streamed via Bluetooth. A built-in loop on the I/O port side is available for attaching the NUU Riptide to an object via a carabiner, lanyard or the like. The NUU Riptide is compatible with any mounting system utilizing a 1/4” 20TPI screw, enabling you to mount it on your bike, ATV, or any other place you like. 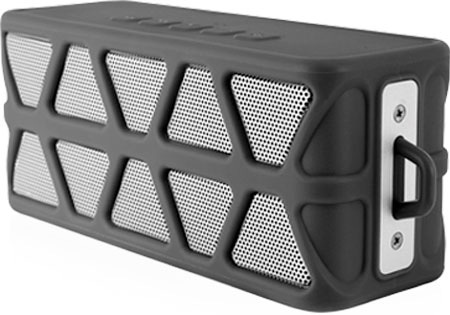 The NUU Riptide has a built-in microphone located under the Power button. This noise cancelling microphone enables you to use the NUU Riptide as a speakerphone in addition to a speaker. indicating that the speaker is on. 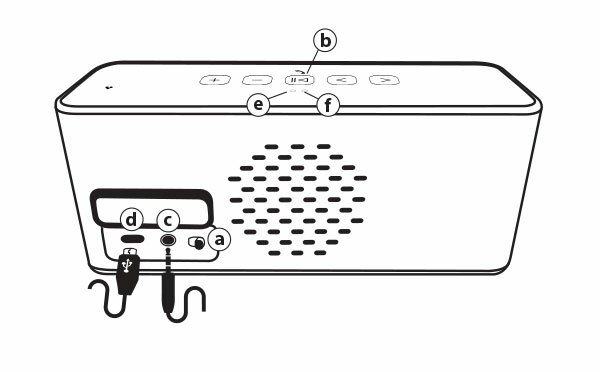 indicating that the speaker has been switched off. Switch on the NUU Splash. The Bluetooth Status Light (e) will flash slowly. documentation that came with your device for further information. Light will remain steadily lit. supplied 3.5mm input cable to plug and play, no Bluetooth required. Audio content via 3.5mm stereo input will override audio streamed via Bluetooth. For best results, ensure the NUU Splash is fully charged before use. outlet. The green charging indicator will remain illuminated while the unit is charging. hours for the battery to fully charge. The NUU Splash may be used while it is charging*. The NUU Splash is switched on, but not paired to a Bluetooth device. The NUU Splash is in pairing mode and ready to pair with your phone or Bluetooth device. The NUU Splash is paired with your phone or Bluetooth device and ready to use. charging, this light shows green until the NUU Splash is fully charged. On: Slide the switch to the left to turn the NUU Splash on. When powered on, the Splash says “Power On!” to indicate this. Off: Slide the switch to the right to turn the NUU Splash off. When powered off. NOTE: Do not flip the power switch on/off rapidly. Wait for the sound before moving the switch again. This is a small light above the Action Button that illuminates to show the current status of the Splash’s Bluetooth connection. (Blue)Flashing Slowly: The Splash is on and is not in pairing mode. This is also the indicator for “auto-reconnect”, where the Splash attempts to connect with the last paired Bluetooth device immediately after it is powered on. (Blue)Solidly Lit: Paired and connected. (Green)Flashing Slowly: FM Mode active. (Green)Flashing Quickly: FM automatic channel scan in progress. (Green)Solidly Lit: Line-in mode active. Every time you power on your Splash, it starts in Bluetooth mode. Use the Action button to switch to FM and Line-in modes. Wait for the Splash to fully enter Bluetooth mode. You will hear either “Bluetooth connected” if you previously connected a phone to your Splash, OR you will hear “Waiting for connection” if you did not. When you hear one of those phrases, you may go to step #3. NOTE: Procedures for activating Bluetooth will vary across devices. Consult the documentation that came with your phone or other device for further information. While paired, the Action button controls the play/pause functions. Click the Action button once to pause, click it again to resume playback. If the Splash was previously paired with a device but has not reconnected to that device, you can click the Action button once to start a re-connection attempt. Usually this is not necessary, but you may need to do this if your device goes out of range of the Splash and comes back into range later. While in Line-in mode, clicking the Action button once mutes the sound. Clicking it again un-mutes the sound. Press or hold the volume keys / to adjust the volume. When you reach maximum volume, the Splash will say “Maximum volume!”. There is no voice prompt for minimum volume. The Splash can connect to any device with a 3.5mm headphone jack. Use the supplied 3.5mm input cable to plug and play, no Bluetooth required. You must first switch to Line-in mode in order to hear playback. NOTE: Accessories supplied do not meet waterproof and dustproof specifications. For best results, ensure the Splash is fully charged before use. Connect the supplied Micro-USB cable into the charging port , and plug the USB side into your computer or a USB AC adapter (adapter not supplied). The red charging indicator will remain illuminated while the Splash is charging. The indicator will go dark when the unit is fully charged. The indicator flashes red when the battery is low. Allow 2.5 hours for the battery to fully charge. The Splash may be used while it is charging. NOTE: If you intend to use the Splash while charging, audio output quality may suffer during playback while charging via computer. A flashing red light indicates that the battery is low and should be recharged soon. When charging, this light shows red until the Splash is fully charged, at which point it goes dark. 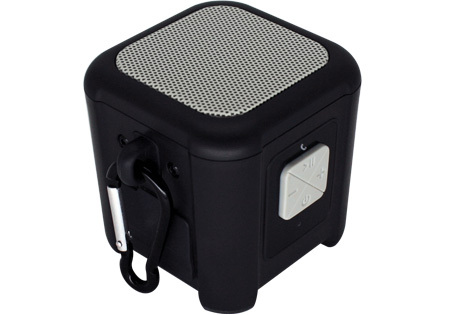 The Splash may be used as a wireless speakerphone when paired with your phone via Bluetooth. Use your phone to dial as usual, and speak toward the built-in microphone located at the top of the unit. The built-in microphone only works when your phone/device is connected via Bluetooth. Incoming and outgoing calls are given priority over all audio playback (Bluetooth, FM, and Line-in). When a call comes in, playback will pause. Playback will resume once the call has ended and the Splash switches back to the mode it was in (if not in Bluetooth mode). Action Button: Click the Action button to answer an incoming call. Click it again to disconnect the call. Next Track: Press and HOLD to dial the last outgoing phone number again. Previous Track: During a call, press and HOLD to switch the call between the Splash and your phone. When an incoming call is ringing, press and HOLD to send the call to voicemail. When you are streaming audio via Bluetooth, you may press the button to skip forward to the next track in your playlist. Press the button to skip back to the previous track in your playlist, or to the beginning of your current track. ff switch that illuminates to show the current status of the Wake’s Bluetooth connection. Flashing Slowly and Intermittently: The Wake is on and is not in pairing mode. This is also the indicator for “auto-reconnect”, where the Wake attempts to connect with the last paired Bluetooth device immediately after it is powered on. On: Press and hold the button for ~3 seconds to turn the NUU Wake on. You will hear a two-tone (low-high) sound, indicating that the speaker is on. if you are playing audio through Bluetooth, 3.5mm connection, or are charging a device with the USB port. Switch on the NUU Wake. The Bluetooth Status LED will flash slowly. Press and hold the Action Button for about ~3 seconds. You will hear a double-beep (low-low) and the Bluetooth Status Light will flash quickly. The NUU Wake is now in pairing mode. Enable Bluetooth on your phone or other device. * Then select “NUU Wake” from the list of discoverable devices. It will take between 10-15 seconds for the NUU Wake to pair with your device. When pairing is successful, you will hear a two-tone (low-high) sound and the Bluetooth Status LED will remain steadily lit. *NOTE: Procedures for activating Bluetooth will vary across devices. Consult the documentation that came with your phone or other device for further information. The Action Button doubles as a “Play/Pause” button. While music is playing, press and release the Action Button to pause the music. Press and release button again to resume playback. 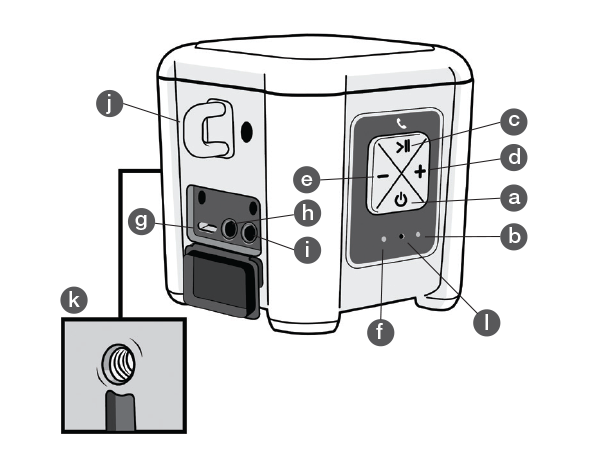 The NUU Wake will attempt to reconnect with the last paired device when it is powered on. 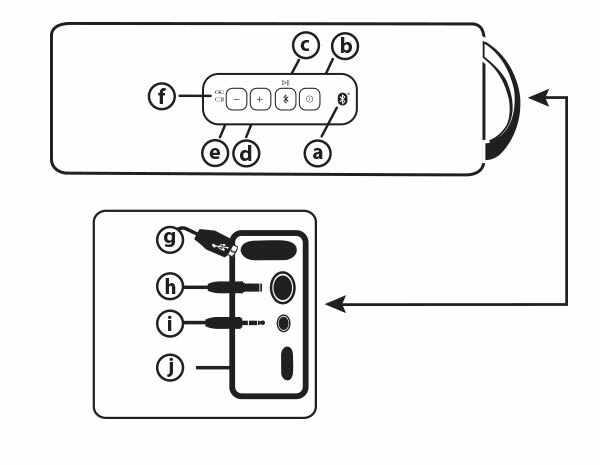 Additionally, if the Wake is moved out of range of the currently-paired device, it will attempt to reconnect when brought back in range. Press or hold the volume keys to adjust the volume. The NUU Wake will beep with each change in volume. When you reach maximum volume, you will hear a high-pitched beep. When you reach minimum volume, you will hear a faint low-pitched beep. NOTE: Volume may only be adjusted while the NUU Wake is either connected to a Bluetooth device or is connected via the AUX-IN port. When connected via AUX-IN, no beeps are heard when changing volume.
. Fully charged, the Wake will have up to 7 hours of playback time. The Red Low Battery Status LED will turn on when the battery has only 15 minutes operation time left. NOTE: Battery life varies by volume and audio content. This port provides a standard USB-A socket with which to charge your USB devices. Turn the Wake on, and plug in your device’s USB charging cable to start charging your device. NOTE: USB-A socket has an output limit of 5V —- 1A. NOTE: While smartphones should charge normally whether asleep or awake, larger devices such as tablets may need to be asleep in order to charge from the Wake’s charge port. NOTE: Charging your USB device with the NUU Wake will impact battery life and playback time. For best results, ensure the NUU Wake is fully charged before use. Connect the supplied AC power adapter to the DC Input, and plug it into your wall outlet. The Battery LED will be solidly lit while the Wake is charging. The NUU Wake may be used while it is charging. The NUU Wake can connect to any device with a 3.5mm headphone jack. Use the supplied 3.5mm input cable to plug and play, no Bluetooth required. NOTE: Accessories supplied do not meet waterproof and dustproof specications. This is used solely by Technical Support. Do not plug anything into this port.